I think about it often and then get stuck as to where to start. 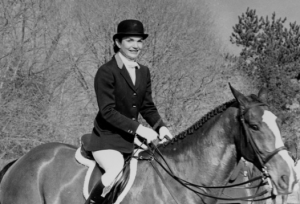 The Equestrianista blog started sitting at a kitchen table in mid October of 2012 with an old equestrian friend and a glass or two of wine(ok it was probably a bottle shared between us if I really think about it). The Equestrianista started because I needed an idea, I needed change in my life, and I needed a chance to create something. Also.. who knows who I would meet along the way, get to know, find other opportunities out there! So Why Not Do This and see where this Journey would take me? OMG If you told me then where I would be now- I would’ve bet you were lying and making up the biggest story EVER! But I guess I should back up to the beginning – enter at A, go down the center line and halt at X to start. When I was young, my parents enjoyed taking long walks together. As I’ve been told, my dad would pack me on his back and they’d go for a long walk exploring around. 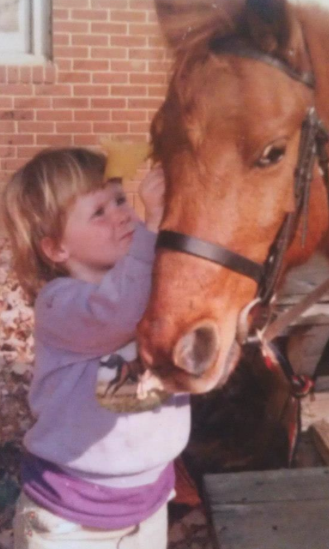 Little did they know, that going to pet the horses, one day at the local barn, would influence my entire life. At age 2, I was pony crazy and with a little luck on my side, there was a very small pony for sale by the name of Peanuts at the local barn. Some things have never changed, I love decorating the house, making things, etc…My favorite color is purple, and I have a soft spot for chestnuts. Yep this picture sums it up pretty much! 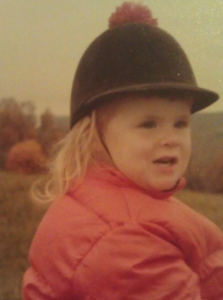 From the very beginning, I was a total pony girl, even when I was not spending time riding or at the barn. 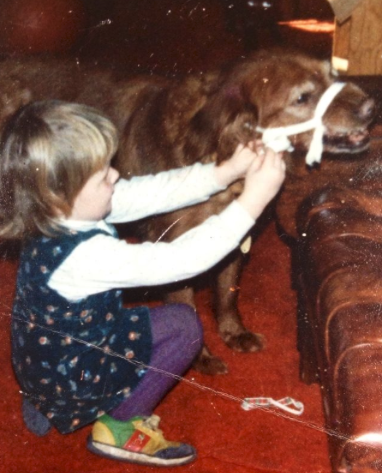 Here is evidence, I used to make cloth bridles for the dog, pick her “hooves” and lead her around the house. When this wonderful dog passed away, from cancer, not my horsing around, I got a Jack Russell. I continued my horse training by collecting empty plant pots and sticks to jump her in the back yard. *On a side note, a Jack Russell and an active child are a perfect pair- they will wear each other out! From out of the womb, I’ve always been very independent. 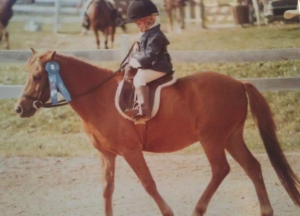 I have been reminded by my father that I used to yell at him for trying to help me put my saddle on when I was 3yrs old. Even though I was not strong or tall enough to get it on and would belt the pony in the side with the saddle. By age 4, I wanted to be just like the cool teenage girls and take jumping lessons. So my dad would put rails on the ground and lounge me over them as I bounced around on the saddle. Also at the grounds of the USET, there used to be a very big International 3-Day event by the name of Essex 3-Day. The Jersey Fresh 3-day has essentially taken its place. There is also a very well known international driving event called Gladstone Driving Event. There were two great saddleries in the area. Bevals, which is a very big fancy English riding tack store. 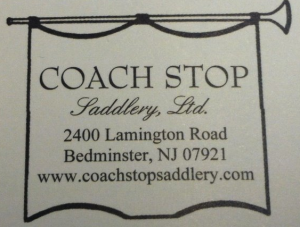 Coach Stop Saddlery, one of my favorite places to go as a kid. Just the other year I went to visit and check it out. It smelled the same and brought me back. It was wonderful! Far Hills Races, in October, is one of the largest steeplechase events around. Its one of New Jersey’s biggest social events. These horsey things really stick in my head as far as being first influences in my life to be a pony crazy Equestrianista. Yes I rocked the Pompom, it was trendy back then! Products of the early 80’s! Gotta love them. Until next time- keep riding and styling! Next Post DIY June- It's a Strap Wrap!